New Tiny House Lakeview Tiny House, The Village at Flat Rock, NC Spacious screen porch overlooking Lake with fountain, Private Bedroom plus Loft. 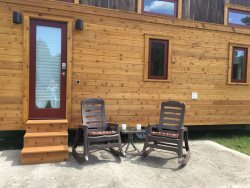 Stay at this Tiny House, Lakeview by the lake at The Village at Flat Rock, NC and you may not want to leave! An airy feel , wood throughout and delightful decor surrounds you here. Vaulted ceiling in the open area. Surrounded by warm, yet light wood inside, and many up-grades in the Cabin's interior design. The kitchen is beautiful with granite countertops, an island with 4 bar stools for sharing your meal with your loved one, and roll it away once you are done ( a movable island). Stainless Steel Full Size refrigerator, Gas stove/oven, microwave, and fully equipped for 4 Guests to prepare and enjoy cooking and eating their favorite dishes. There's a small coffee maker and toaster for your mornings. The sleeping quarters are delightful, the one bedroom has a flat screen TV, a Queen Bed, and a spacious spa like bathroom, tile tub/shower, granite vanity and tile floors. Note; it has a door into the bedroom and another door to the open living area for privacy. The LOFT has a Queen Bed for 2 more guests. Relax with the breeze of the ceiling fan, in the cabin and out on the screened in porch. The screened in porch overlooks the Upper Lake with fountain. Lakeview faces the pond with the fountain, you can hear the waters from the deck. Enjoy the view as you visit with a friend or maybe a new neighbor friend from the Village. Your small, 25# dog is also welcome, please pay the pet fee and follow Village Dog Rules, (Village Rules posted on the Refrigerator). SIMPLE LIFE has strict restrictions on types of dogs, please ask us. (Keep dog on leash and pick up after your dog - thank you) And, enjoy the doggie park in The Meadows. A block Island on wheels you can move out of the way after dining, with 4 chairs. Gas Fireplace in the Open Area. Plenty of comfortable seating for relaxing. Staying in a tiny home is an eye opening experience in the functionability of well arranged square footage. It is a lot more fun than a hotel room or suite and a better value all the way around. We truly enjoyed the coziness of our house. We enjoyed a wonderful tour and wine tasting at Burntshirt Vineyards. It was a beautiful place. We will be back. The various types of tiny homes. Small under 25 # dog allowed with Pet Fee. Please keep your dog on a leash while outside, and clean up after him/her. No smoking. 500.00 Fine if there is any evidence of smoking inside the house. Strip the beds and put all used sheets, pillow cases and towels and put in the bathroom. Carefully wash and dry dishes. Remove any open foods from refrigerator(s) and freezer(s). Put all trash in the Garbage bags provided and bring bags to receptacle near Center, past the pool and larger tiny house construction area on your way out, each dumpster is labeled carefully for trash, recycle and cardboard - Thank you. NOTE: Please help our cleaning crew by following the Check Out procedures given to you on your Welcome Letter there. Thank you so much. It is our pleasure to host you and give you a great review after your stay.